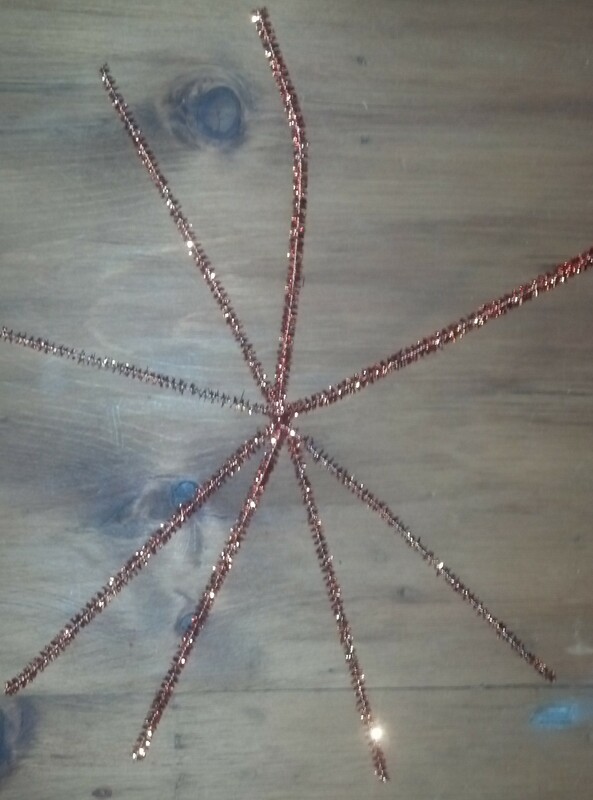 crafty crafts | Creativity = Fun! 1. Cut three equal pieces of yarn about 24 inches. 2. Tie the three pieces together at one end leaving about an inch above the knot. 3. Tape the string above the knot onto a sturdy surface (make sure surface is safe for tape) so the string will stay in place while you are braiding it. 4. Begin braiding, keeping your fingers close to the braid so it stays tight. 5. Keep braiding until the braid goes almost all the way around your wrist once. 6. Tie a knot close to the braid, so that it won’t come undone. Make it as tight as possible. 8. Wrap the wire around one piece of the loose string (Kind of like a needle) and use wire to pull string through bead. 9. Do the same with the other two pieces of loose string. 10. Make another knot close to the bead with the loose string so the bead doesn’t move. 11. 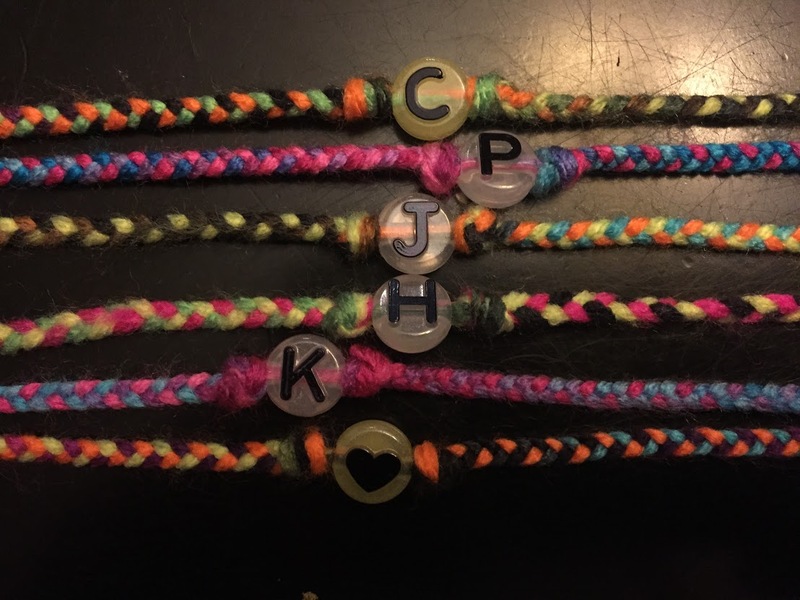 You can make bracelets with multiple letters. The more letters you have, the less you have to braid. You can make spaces between words by adding a knot between the beads or a heart or plain bead. 12. Keep braiding until braid is the same length as the first one. 13. Tie knot close to end of braid so it does not come undone. 14. Place the two knots next to each other and cut off the loose ends so that they are the same length (a 1/2 inch to an inch). 15. Tie bracelet on wrist! 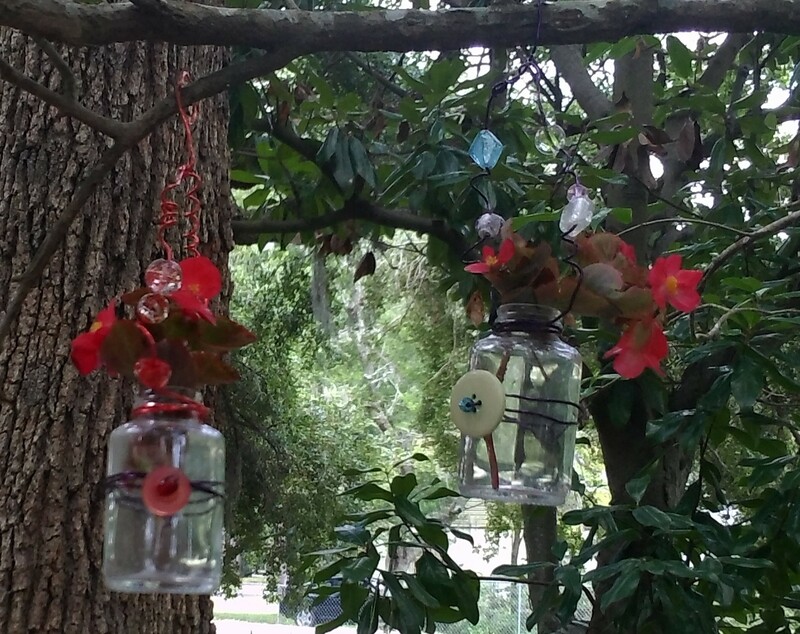 Here’s an easy way to give new life to an old old craft. 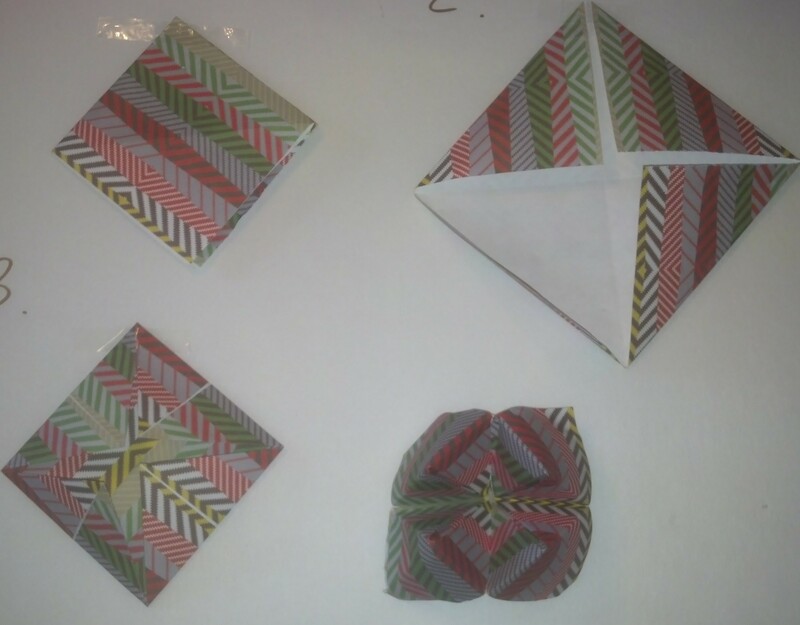 We discovered that scrapbook paper is the perfect shape to use to make paper fortune tellers. The good news is that the thinner, less expensive, sheets work better than the heavy card stock sheets! 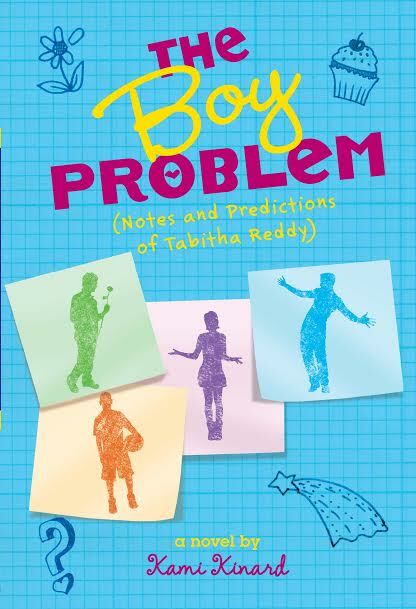 We got this idea because the main character of my mom’s new book, THE BOY PROBLEM, creates a special fortune teller to try to help her find a boy friend. So we were thinking about different ways to make them. 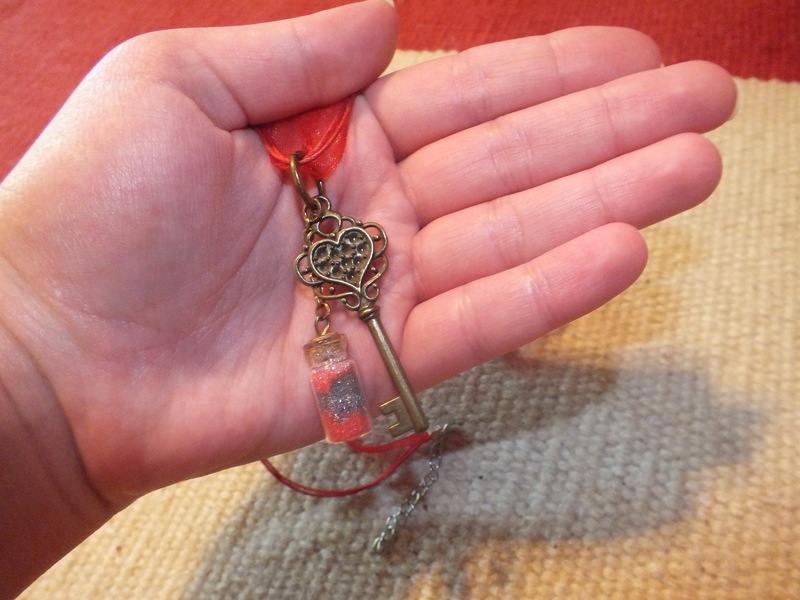 There are four main steps to creating a fortune teller. Four main steps to creating a fortune teller. You can see them here. And you can find detailed instructions for folding a fortune teller out of an 8.5 x 11 sheet of paper HERE. 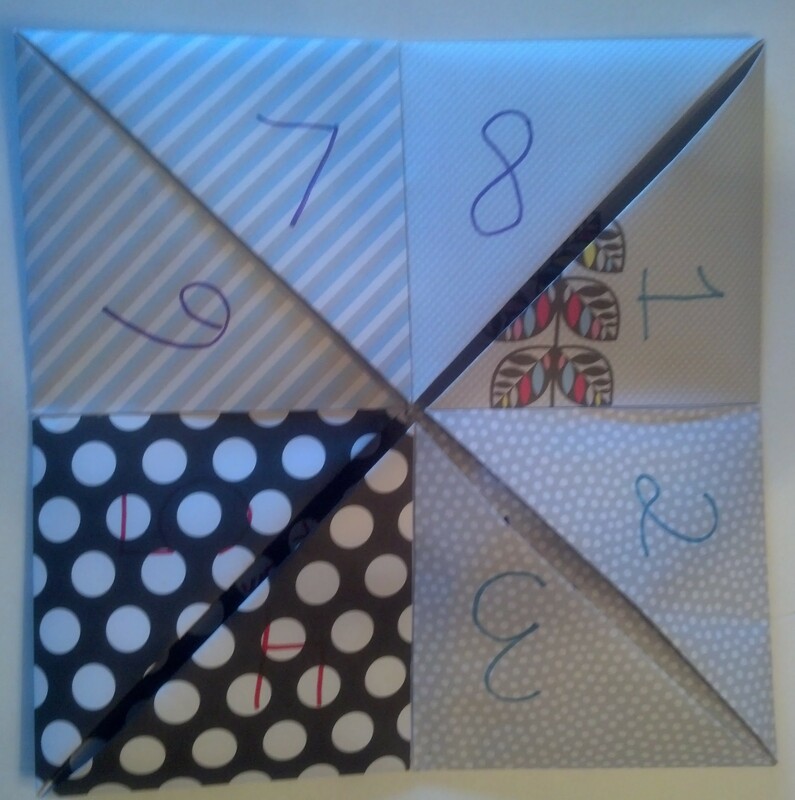 We even discovered that you could make a VERY LARGE fortune teller by taping four pieces of scrapbook paper together before you begin, like the big one pictured above. Here it is opened up. It is neat how each square is a different page. My friend A.M. made this one. We used rubber stamps on some of them instead of words. 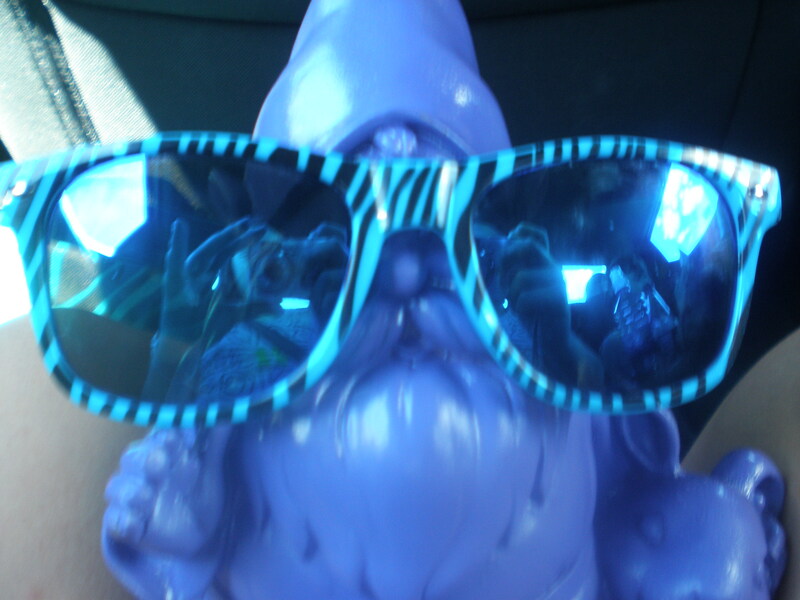 Those turned out cute too. 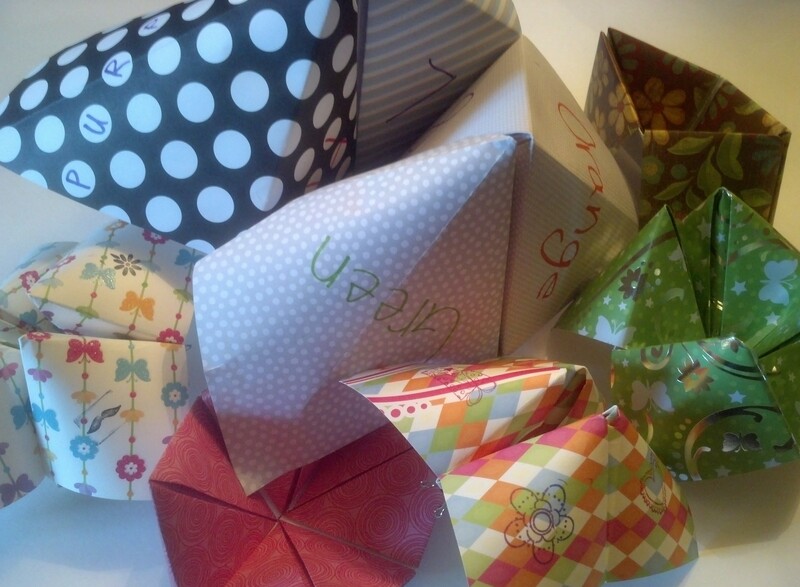 If you have scrapbook paper lying around, try making a fortune teller. It can be in the traditional style, OR you can do some different with it, like Tabbi does in THE BOY PROBLEM. It has been a long time since we’ve posted on Crafty Crafts! 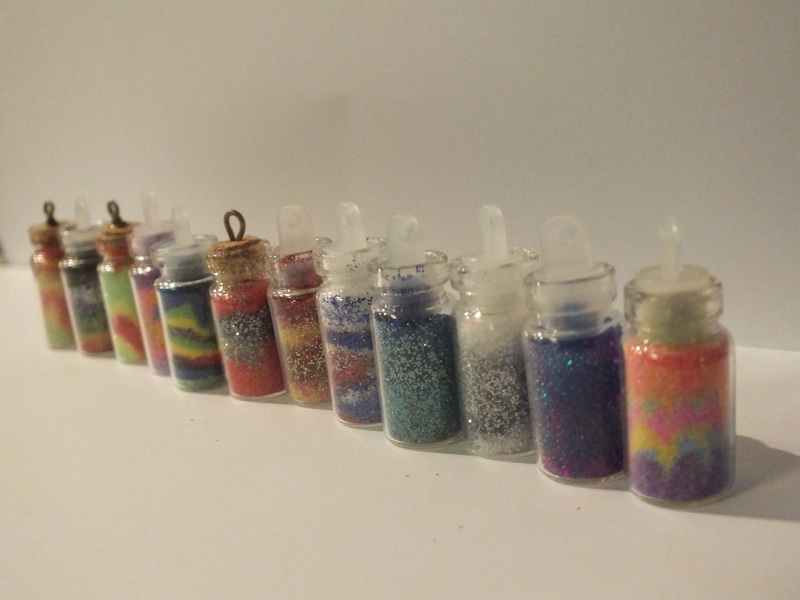 We’ve been busy crafting, and doing other craft-related things and will post more soon! 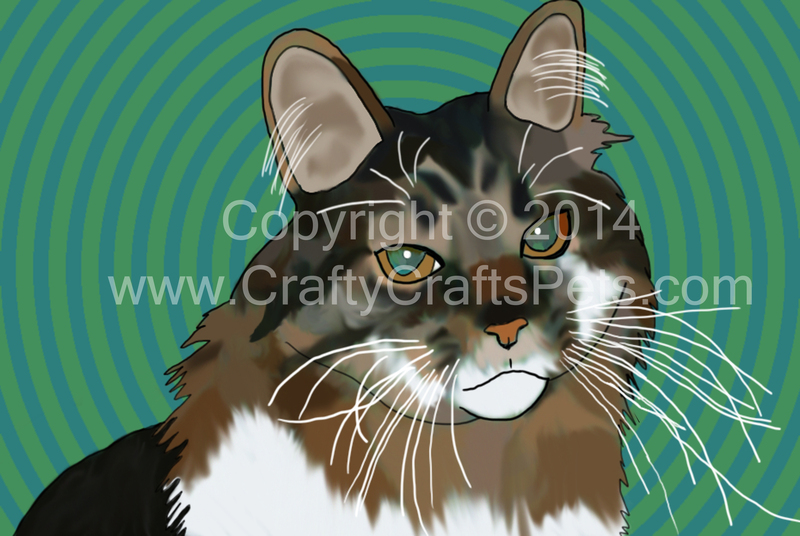 One thing I have been busy working on is creating pet portraits. 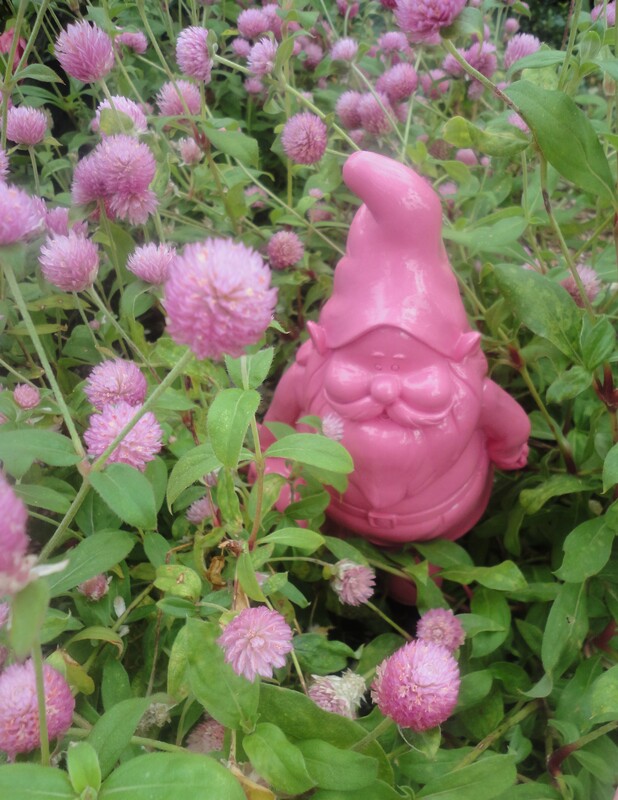 I have started creating them for other people too, and have just launched a blog for that. Check it out HERE to see more portraits like the one below. If you are interested in having your pet’s portrait drawn, contact me using the contact form on the Crafty Crafts Pets site! Right now, you can have a digital drawing of your pet for just five dollars. 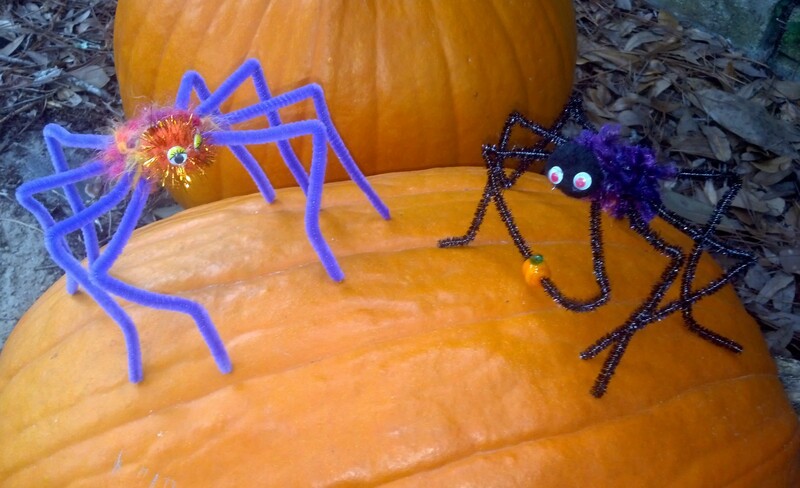 With all of the beautiful pipe cleaners and fun fur available today, it’s easy to make cute spiders for your pumpkin patch (or anywhere)! 1. Cross the four pipe cleaners over each other like the spokes of a wheel and twist at the center to keep them together. 3. When you think the body is the right size, cut yarn, and tie end to loose end at bottom of spider. Trim extra yarn. 4. 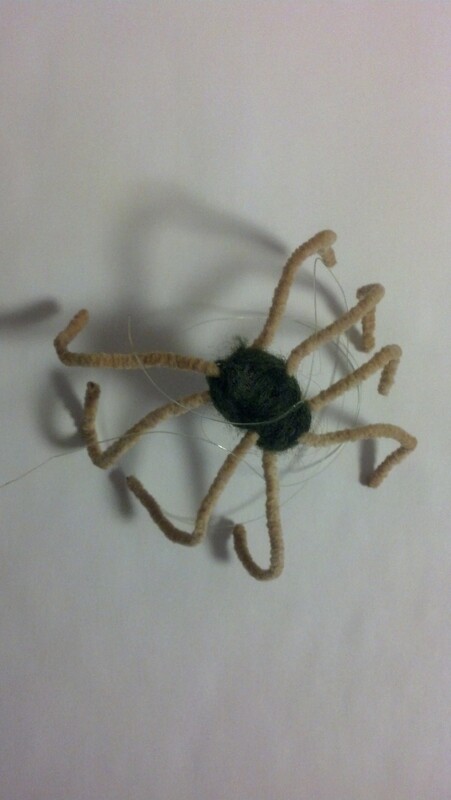 Have an adult help you hot glue a pompom to the front of the spider for a head. 5. Add (at least) two wiggly eyes. *If you would like a spider to be more puffy in the middle, glue an extra pompom to center of pipe cleaners before wrapping with yarn. Wrap yarn around it a few times before weaving through the legs. We did this for the orange spider. 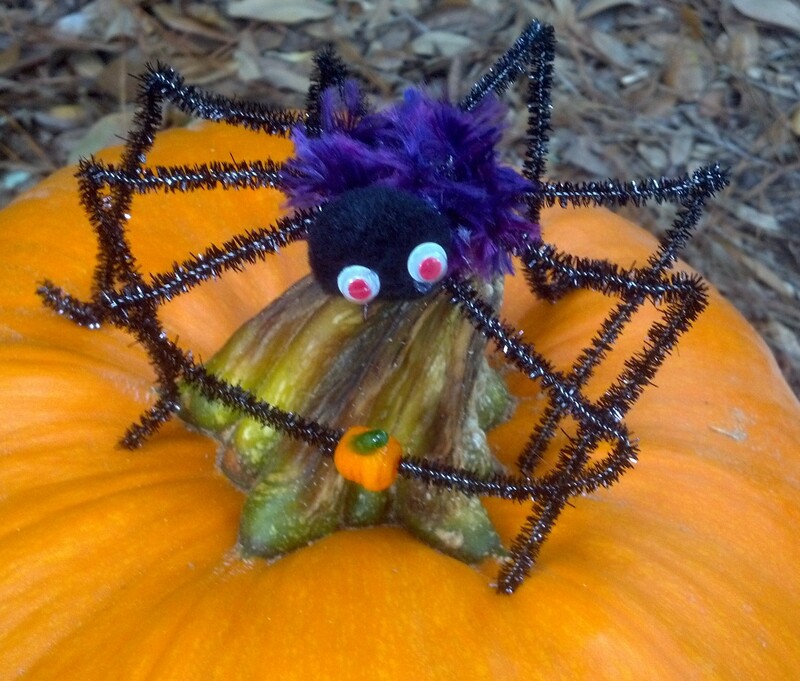 *Add a piece of fishing line and let your spider dangle! This craft was inspired by a craft my mom made in girl scouts. This spider used to have a paper head. It doesn’t look so good anymore! 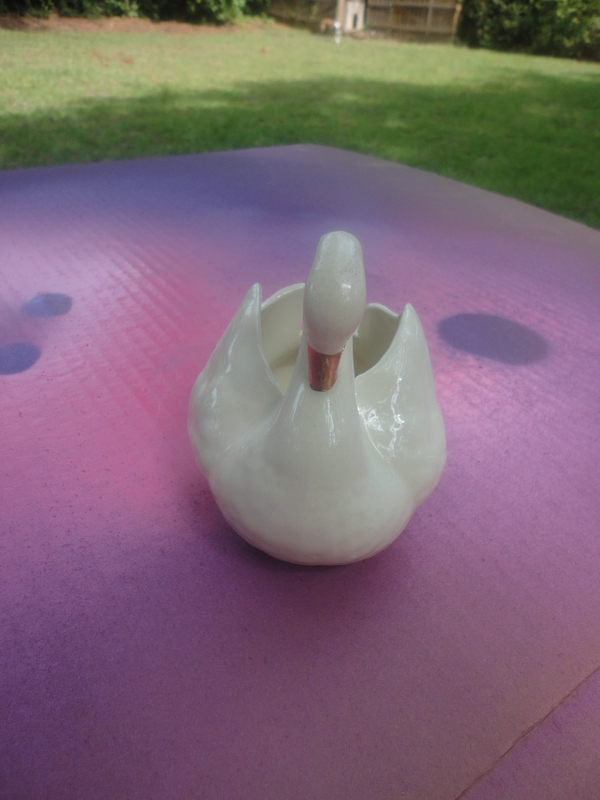 Usually, we make up our own crafts, but we got this idea from Pretty Handy Girl. It is a fun craft and these will make great presents. You can get the directions HERE. The bottles were cute so we wanted to use them. 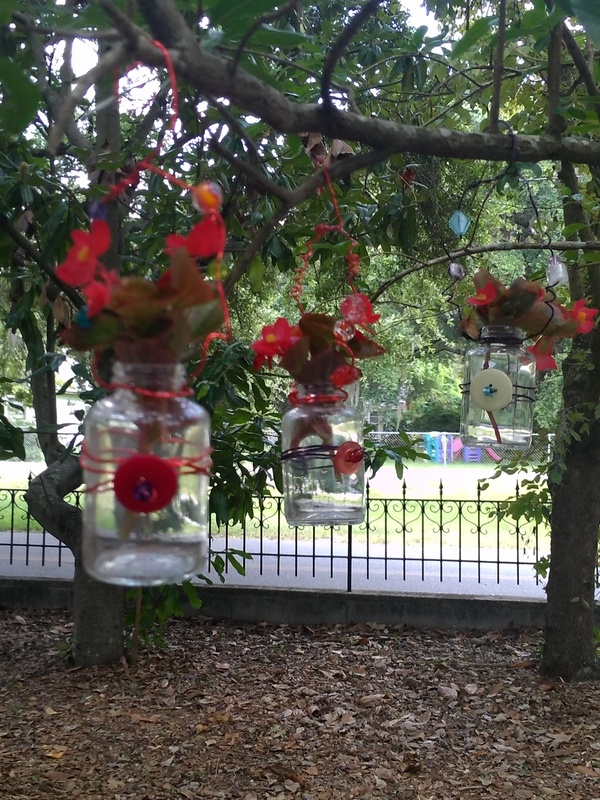 One thing we did differently was that we used colored wire, and glass beads. 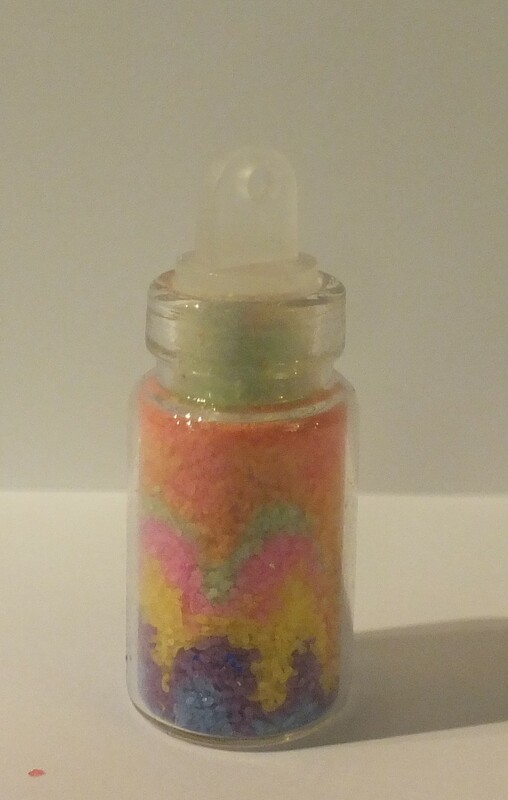 *The worst thing about this craft was removing the labels from the bottles. We finally used cooking oil to loosen the glue, then washed with hot water and cleaned with Windex. 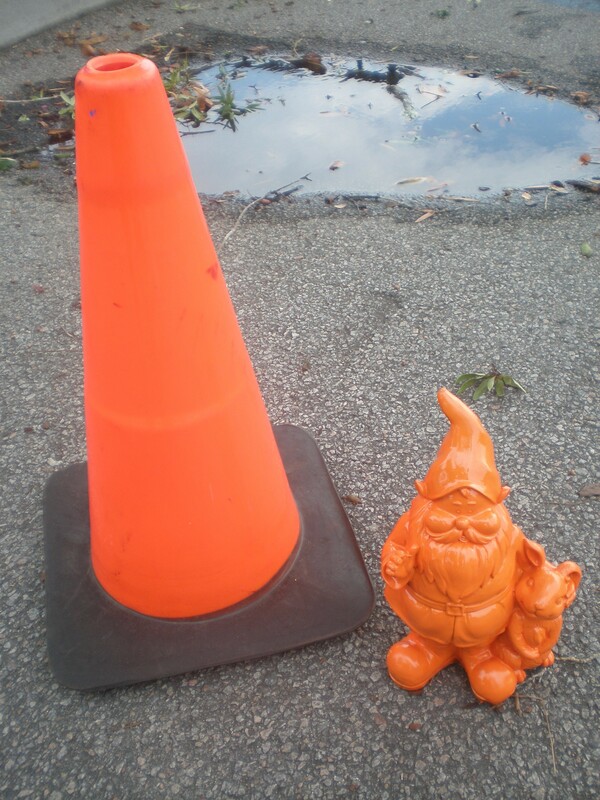 What’s better than a gnome? 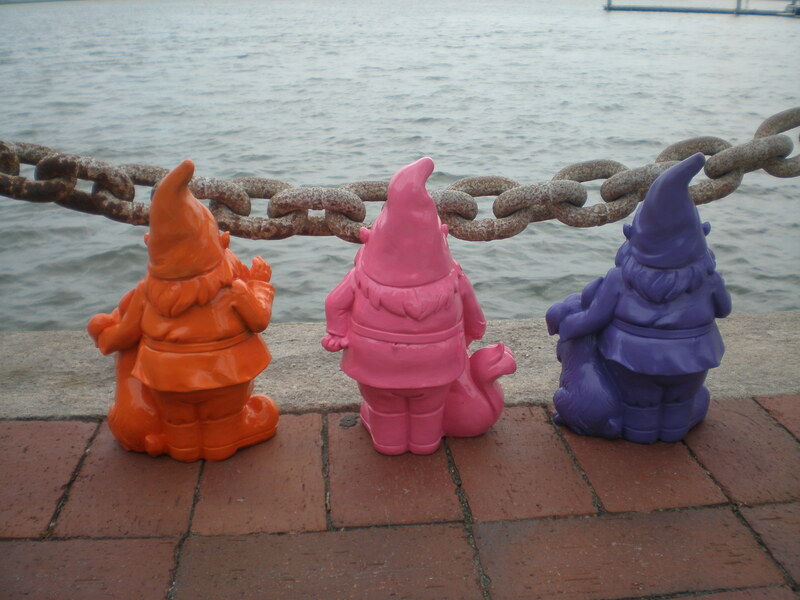 We thought these gnomes would look better in bright colors and we were right! 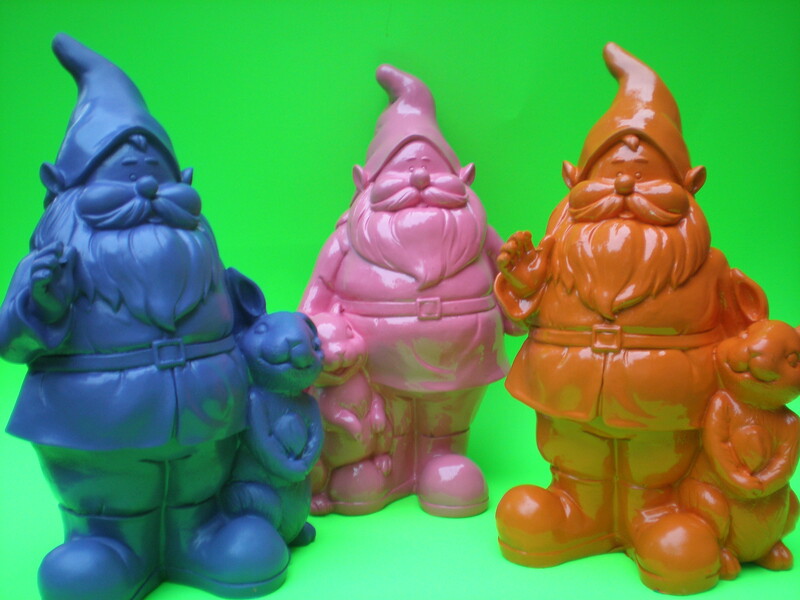 Use spray paint with adult supervision. Follow instructions on paint can. 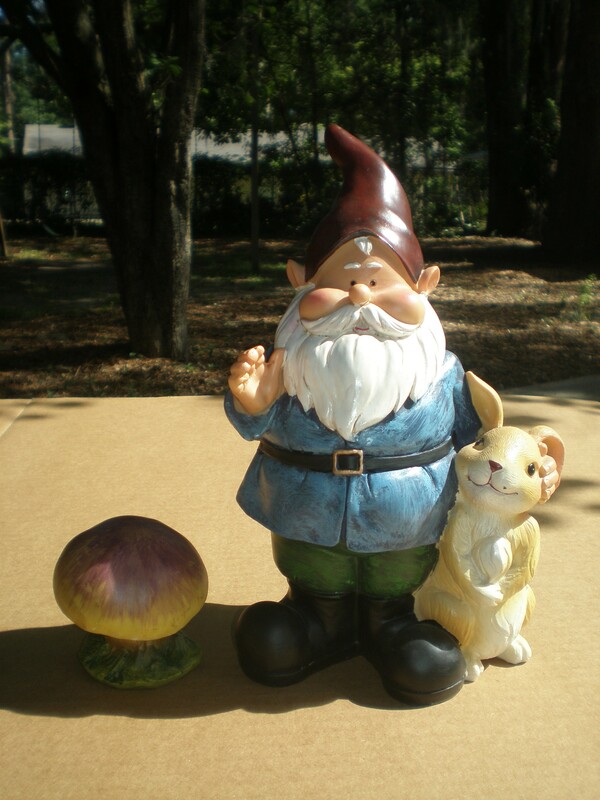 We put newspaper under the gnomes before we started. We applied several coats. 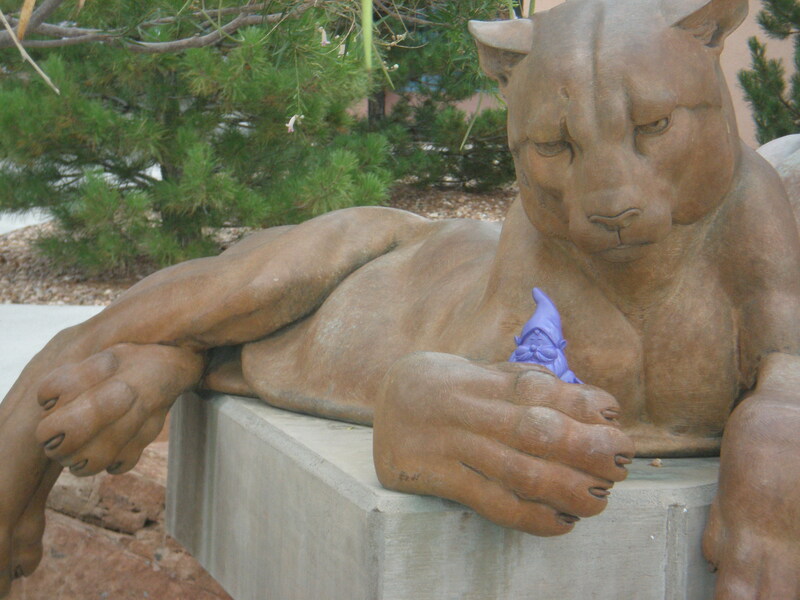 They were so cute that we couldn’t resist taking them downtown. 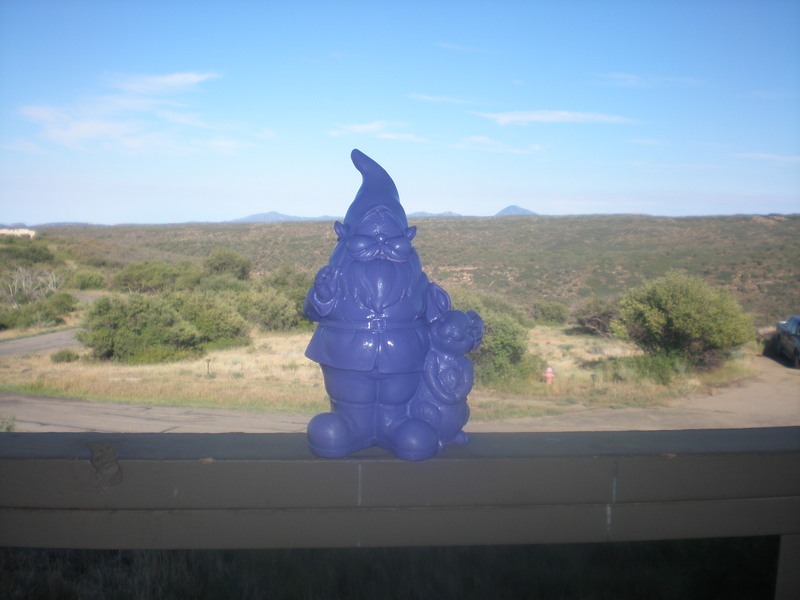 We had so much fun with the photo shoot, that we took one of the gnomes with us to New Mexico. This was an easy, fun craft. 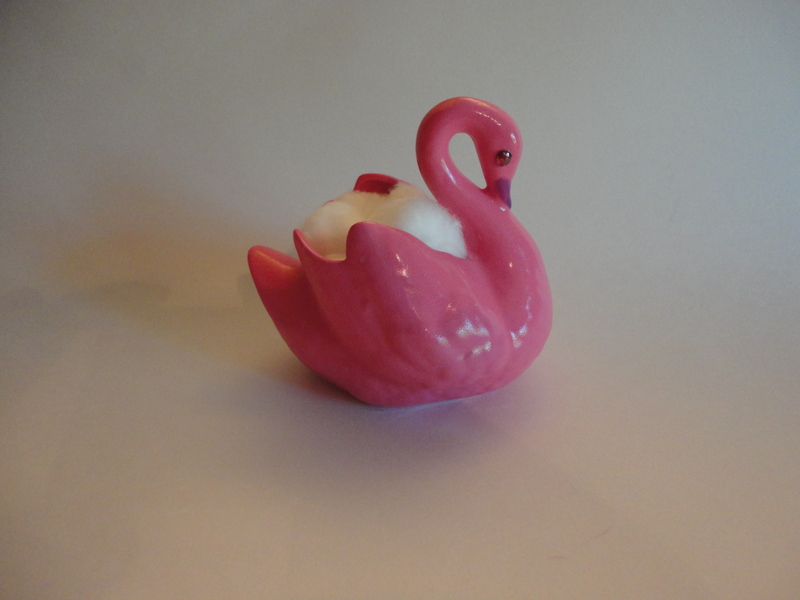 Coming up on crafty crafts: a craft that does not involve paint! 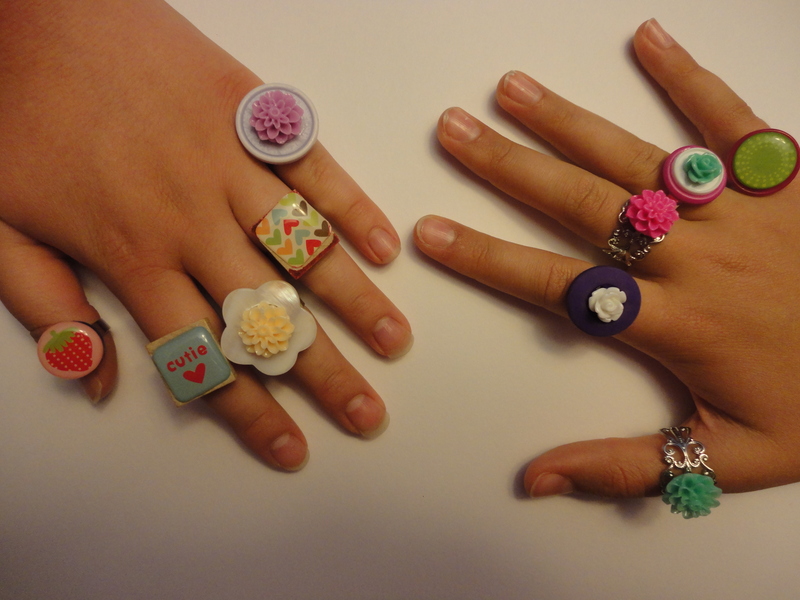 Keeping ring blanks around makes it easy to create cute rings in a hurry. My friend MC and I made these last time she came to visit. 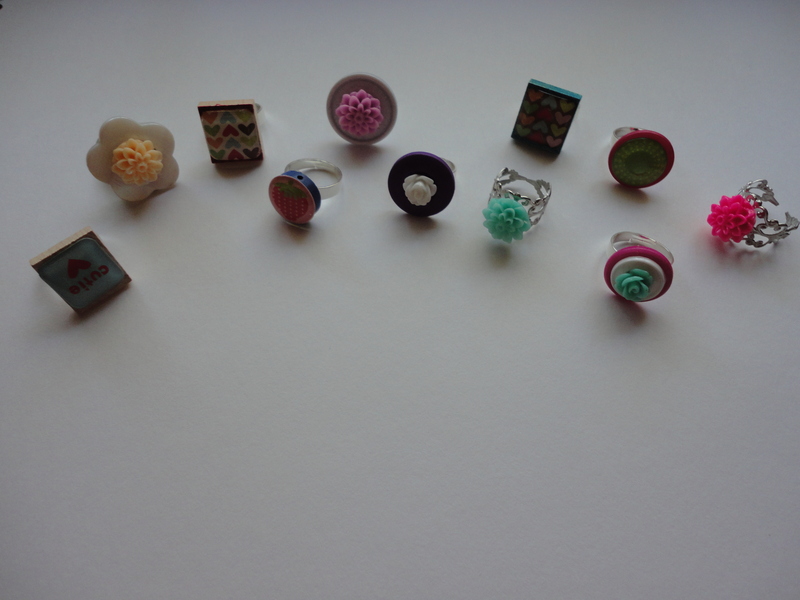 We used stickers, buttons, scrabble tiles, and resin flowers to create these rings. 1. Create a base for your ring by gluing a larger button or Scrabble tile to a ring blank using a strong glue like Crafter’s Pick THE ULTIMATE. 2. 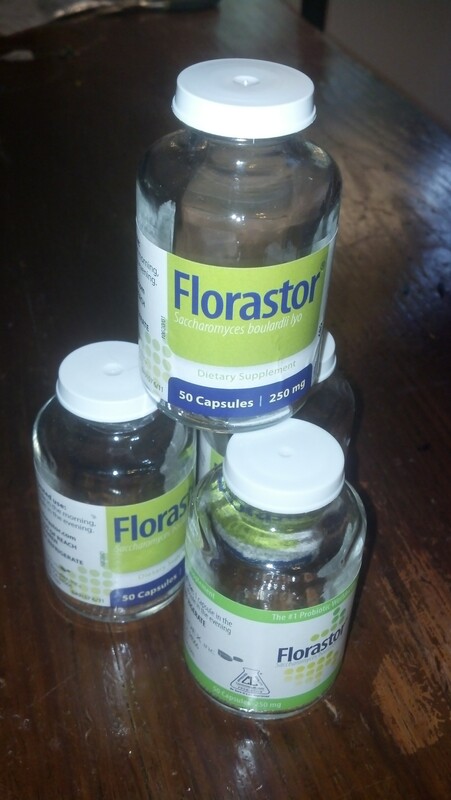 Select a flower, sticker, or smaller button to glue to the base. 3. Allow glue to dry before wearing. It is hard for us to throw away old books, but sometimes they just aren’t useful anymore. 😦 When books have canvas-like covers, we’ve started saving the covers for other projects before throwing the rest of the book away. Here is a Valentine’s Day card we made from a book cover this year. This was super-easy to make. All you need is hot glue and cool stuff to glue to the cover. Notice we cut some hearts out of book pages to go with the theme. Here is another cover we made into a get well card. We love the way the texture on this book cover looked! 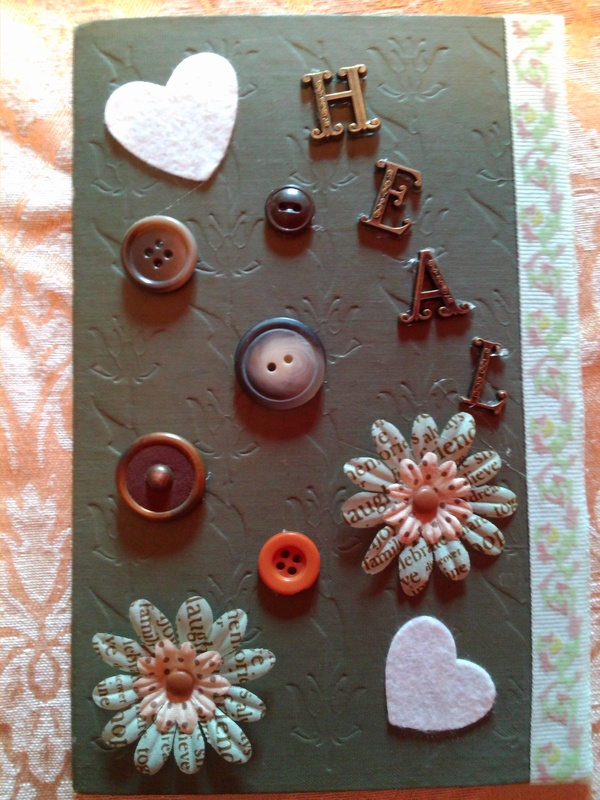 This is a craft we plan to do again, so expect to see more examples of book cover cards here soon! So far, everyone we’ve sent a book cover card to has loved them. Your friends and family will too! 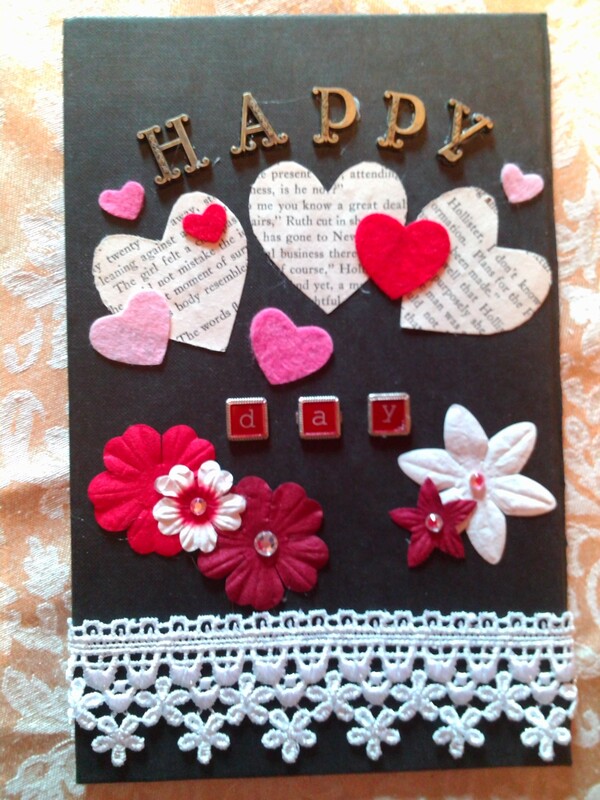 To see this Valentine’s Day craft we posted last year click HERE.